Kazakhstan has renamed its capital Astana to Nursultan to honour outgoing leader Nursultan Nazarbayev, who unexpectedly resigned on Tuesday. The change was announced after Kassym-Jomart Tokayev was sworn in as president, promising to seek his predecessor's opinion on key decisions. 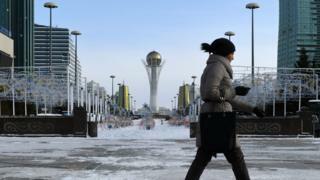 Mr Nazarbayev, 78, served nearly 30 years as leader of the oil-rich nation. Meanwhile, his eldest daughter has been elected speaker of the upper house of parliament. Dariga Nazarbayeva's promotion to the second most powerful position in the country raises her profile as a potential successor. Her father, who is head of the governing party, will remain at the helm of the influential security council and will hold the formal title Leader of the Nation. Analysts say it is too early to say who is going to run or to declare potential favourites in next year's election. Mr Tokayev and current Prime Minister Askar Mamin are also seen as possible contenders. Mr Tokayev was sworn in as president some 24 hours after Mr Nazarbayev's surprise resignation. He will serve for the remainder of the presidential term which expires in April 2020. "[Nazarbayev's] opinion will have special, one might say priority, importance in developing and making strategic decisions," said Mr Tokayev, who had served as speaker of the upper house of parliament. He said the world had witnessed a "historic event" with the resignation of Mr Nazarbayev, the only man to lead Kazakhstan since it emerged from the collapse of the Soviet Union in the early 1990s. Mr Tokayev then proposed changing Astana's name "in honour of the first president" and, shortly afterwards, parliament adopted a law making the renaming official. Astana, which means "capital" in Kazakh, became the capital of Kazakhstan in 1997, taking over from Almaty, still the country's commercial hub and largest population centre. Mr Nazarbayev's 55-year-old daughter Dariga Nazarbayeva, a former deputy prime minister, has long been considered as a potential successor. She once led the country's main television station and founded her own party in the 2000s, before it merged with her father's party. Ms Nazarbayeva made no mention of the forthcoming elections in her brief acceptance speech on Wednesday, Reuters news agency reports.